Cauliflower with Parmesan Sauce, Thyme for Cooking winter vegetables. 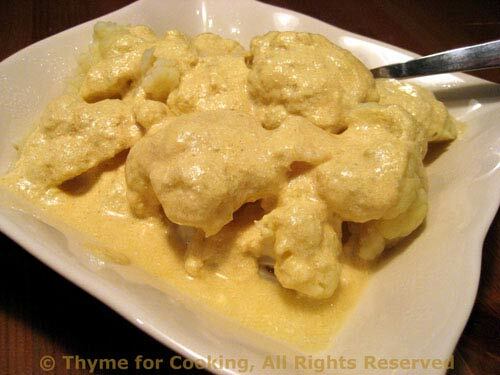 Cauliflower, tossed with a light mustard and Parmesan sauce, is a nice change to simply buttered. 1/3 head cauliflower, enough for 2 people. Cut cauliflower into pieces, put into a steamer basket and steam over water for 10 - 15 minutes until fork-tender. Remove from pan and empty water. Heat stock in the same pan. When hot add mustard, Parmesan and yogurt. Stir well as it heats but do not let it boil. Spoon over cauliflower and serve.